A rideable miniature train - the Emerson Zooline Railroad C.P. 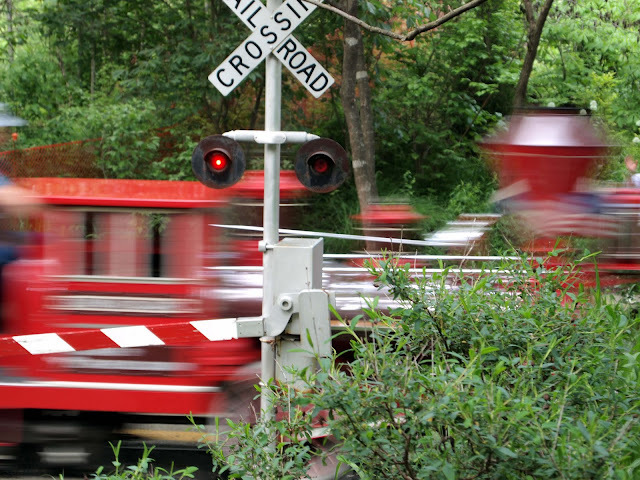 Huntington train - passes through a mock-up railroad crossing in St. Louis zoo. Although 1/3 the size of a full sized Huntington, it is big enough to accomodate a grown-up driver and scores of passengers, mostly children. The zoo's railroad was named after Emerson Electric (the company where I work), as recognition for the latter's $5 million donation to the zoo .